I've spent the last couple of days thinking about the tools I will use next term with my classes (21classes? Edublogs? Ning? Wikispaces? PBWiki? MindMeister?) only to discover that what I'm really interested in is preparing the ground for learning. I don't want to structure and pre-define. I do not want to create a community or a social network for my students. Instead, I want to create the conditions necessary for the right kind of environment to emerge. Building an environment for the students is likely to result in failure: environments and communities need to be build with the students, with their full participation, through their work and their interactions with and about texts. It's not just about choosing a blogging platform and letting the kinds in. We need to move beyond the traditional approach of "pick the tools, add students and stir." Unfortunately, my curriculum is still to a large extent dominated by units, lessons, assignments. Those are the realities of teaching and learning in North America in the 21st century - it's not about the process, it's about the product. So, as a teacher in the 21st century, I am taking a stand: I want to have a classroom where my students can enjoy learning experiences. Instead of dividing the curriculum into neat chunks, I will try to set the stage for the right kind of environment to emerge - the kind of environment where learning experiences can take shape. The kind of environment that is similar to what Ben Wilkoff has termed, "the ripe environment," one characterized by "a culture of connection." Respect given to the children will conquer any love once given to them Our training methods constant and cruel On the front lines of battle, they shed blood for us We are the R.U.F's, envisioning only supremacy The children have sorrow in their eyes longing to defeat the enemy They cry, Scream, Weep for victory. So many rules to follow: Be Quiet! Walk Slowly! Sit Down during the day! Read, write just be quiet....during the day! When the sun has gone down and the moon has gone up There are different rules: Walk Around Be Free But Don't open the windows Or go outside! There is so much time but soon.... Sooner than you think There will be no more time left. At first, while certainly very impressed by the creative work of these thirteen-year-olds, I did not think that there was anything out of the ordinary about it. Then, I realized that there was. Having become researchers (one might even say content experts) in their respective fields, Vanessa and Trudy started contributing. Yes, contributing! We don't often think of students as contributors. Even in the context of Web 2.0, I often talk about collaboration and connections, but rarely about genuine contributions. These poems, it occurred to me one day, are learning objects - they are unique artifacts that I can use next year with another class when discussing child soldiers or Anne Frank. Much like edubloggers around the world who, through my aggregator, contribute to my knowledge of learning in the 21st century, these girls were contributing specific artifacts to the topics they chose to study. 1. DISCOVER: First, the students were given the freedom to pick a topic of interest within a specific context that we had entered through our discussions of literature - the context of social justice. I gave all my students sufficient time to think about what they were passionate about, visit some sites, read some articles and uncover that one specific topic that they wanted to learn more about. At this point, the students were really just surfing and lurking. They were visiting various sites and communities to explore topics that were of interest to them as potential ideas for future research. There were no conversations here, just fleeting interactions. 2. DEFINE: During this stage, I gave the students time to post some preliminary entries on their blogs, to think out loud about their topics in general terms before they started their research. The point here was to allow them the freedom to start defining their research topics and possible ways of tackling them. 3. IMMERSE: The next step was the longest and most complex. Having narrowed it down to a specific topic, the students then were given time in class to immerse themselves in the topic, to learn more about it, to start looking for, identifying, and interacting with valuable resources. This was an opportunity to bookmark relevant content and use RSS to start creating a network of valuable and reliable resources (I want to extend it this year to a network of peers and adult experts). I wanted my students to become researchers who locate valuable content, read, interact, and document their learning on the blog by writing entries about the topic and their journey as researchers. 4. BUILD: The students' efforts to document their discoveries and their learning contributed to the process of building their own knowledge in this specific area. The entries showed me and their peers - our whole community - how much they were learning. These were thoughts made visible. The students used their blogs to document their research and to build their own knowledge in their respective fields of expertise. There were many connections that emerged among students researching related ideas. The students interacted with each other by posting comments and by sharing and commenting on resources. They were engaged in their own research projects as individual researchers but, at the same time, there emerged many small networks within our class blogosphere of students interested in similar topics. They were all engaged and connected. And that was where the process ended, or so I thought until I noticed Vanessa's poem and then Trudy's. Both girls were contributing unique, personal content to the fields they chose to research. 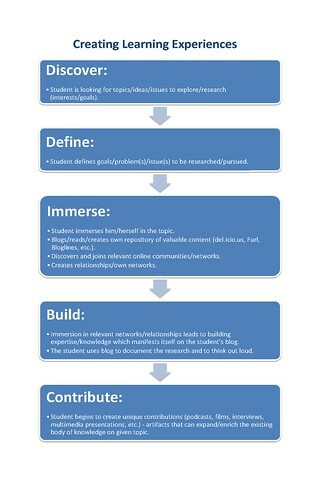 That's when I realized that in order for the learning experience to be complete, the students needed to go beyond researching, connecting, and network-building to become creators and contributors. Of course, one could argue that their research entries contributed valuable material to our class community, but this - their poetry - was unique and personal. These were artifacts which, despite their personal, literary, and creative nature, could enrich anyone's understanding of child soldiers or Anne Frank. They emerged because the girls went beyond the process of documenting their research. So, I realized that there was one more, final stage in this process. 5. CONTRIBUTE: This final stage happens when, as learners, the students begin to contribute through their own creativity. It happens when, having acquainted themselves with the topic, they begin to rewrite or remix it in their own unique way and thus contribute to and enrich the field they're researching. This is the stage when the students begin to create unique artifacts that contribute to the existing body of knowledge on a given topic. This final stage is not just about contributing links or resources to a group project or to a community. It is primarily an exercise in creativity. It begins when the students interact with ideas, resources, and people to create or enter a network. Once they can tap into the collective intelligence of their networks, they can begin to learn, and once they begin to learn, they can also begin to create their own resources - podcasts, films, creative writing, or any other artifacts that can then be used by others and can enrich their grasp of the topic. Why can't this fifth stage replace my traditional evaluation strategies? Why can't I replace tests or assignments given to the whole class with the kind of engaging and personally relevant approach to learning that is encapsulated in the five-stage process above? I think it can certainly be accomplished but, first, I need to foster in my classroom the kind of environment where this five-stage process can take place. This means that I need to think about how to create the kind of environment that fosters and supports learning experiences, not the kind of environment that imposes them on students. Perhaps, what I'm really interested in is what Dave Cormier calls "habitat." He states that a proper habitat can "make it more likely for community to form and more likely that that community will do the kinds of things that were intended … that prompted the creation of that habitat." In other words, as Dave argues, "a careful attention to the construction of habitat can increase the chances of a community forming." I spent the last three years creating communities with my students and I learned that if the right (ripe?) environment is there, the community will emerge. It seems to me that the approach I described above can help create the kind of habitat that will lead to the emergence of networks, correspondences, and - most importantly - contributions. In order to make all of this happen in a grade seven or eight Language Arts classroom, I need to think about facilitating connections and supporting my students in the process of creating their own networks where their contributions - poems, interviews, chatcasts, blog entries, podcasts, films - will be seen as enriching artifacts. This term, my grade seven students will be reading and writing poetry in an online community of writers where they will be given electronic portfolios and encouraged to share their own poetry and participate in poetry discussions. As writers, they will receive tremendous support from an experienced and accomplished Canadian poet, Douglas Burnet Smith. He will be our Electronic Writer in Residence this year and will work one on one with each of my grade seven students by responding in detail to their creative work and answering their questions about poetry, creative writing, and the writing process in general. In short, from his office in Antigonish, Nova Scotia he will cultivate a community of poets. I am confident that his presence, although virtual, will be of immense benefit to the students and will have a strong impact on the development of their writing skills. But there is another thing that, I hope, will have a positive effect on my grade seven students. Some of my former students that I mentioned in my previous entry have agreed to participate in this creative writing community as grade nine mentors. They are no longer at my school but have expressed interest in working online with my grade seven students and helping them become stronger writers. Much like Mark Ahlness who has made it possible for his former students to return to their old community as "alumni," I, too, decided to use the energy, the enthusiasm, and the talent of my former students in the new community where they will be able to work with the Writer in Residence and over forty grade seven students. The reason I've decided to bring in both an accomplished Canadian poet and my former students who have studied poetry with me and have demonstrated excellent writing skills is to create a climate where literacy can flourish. I know that they will enter this community as writers because that is exactly who they are. While Douglas Smith will be both an inspiring and intimidating presence, I hope that gradually, my grade seven students will see that, as a writer, he faces the same blocks and the same frustrations as they do. I am hoping that this will challenge them to function inside their zone of proximal development, which "defines those functions that have not yet matured but are in the process of maturation, functions that will mature tomorrow but are currently in an embryonic state" (Vygotsky, 1978). I am hoping that the words of Douglas Smith and of my former students can create a climate that "awakens and rouses to life those functions which are in a stage of maturing" (Vygotsky, 1978). I am hoping that the students will be motivated to write with a poet and a handful of high school students who understand what it means to nurture one's own creative, expressive, and exploratory voice. So, the question is, How do we do it? The answer is, quite simply, that I'm not exactly sure how this can be done. However, I am convinced of one thing - I believe that all of the above can be accomplished only if the Writer in Residence and the five grade nine students are not viewed as experts. I don't want them to enter this community and say to the sevens "I've done this before, and now I'm here to tell you everything I know." Instead, I hope that both the nines and Douglas Smith can create an environment that will help the students embrace writing not as something that is done at school but as something that is deeply personal, expressive, and human. In a community of writers, we need writers and not experts. We need inquiring voices and not voices that preach. So, I believe that both Douglas Smith and my grade nine students need their own portfolios in this community. They need their own virtual places. They need to write. The last thing I want to do is ask them to only read and critique. I believe that each participant, regardless of how old or how experienced, can contribute more by writing and engaging in conversations about writing than by merely critiquing. I want all of the participants in this creative writing community to come together through texts. I want every participant to be a writer and a reader. I hope that motivation, knowledge, and literacy will emerge through interaction with and about texts. I hope to see "cognitive apprenticeship" where students are not mere recipients of instruction but developing members whose every text helps them find their own voices (Collins, Brown, and Newman, 1989). In other words, I want to create an environment where creative, expressive writing can flourish and where texts combine into episodes of interaction and intertextuality. At the same time, I'm trying to find a role and a place for myself. Where do I fit in? What is the role of the teacher in such an environment? What impact will it have on my presence in the classroom? Should I enter the online community of writers as one of its voices, or should I stay away? Should I try writing poetry and engaging with my students and our guests in conversations about texts? I'm tempted to stay away from the online community and see what happens when the students interact with writers and not teachers.